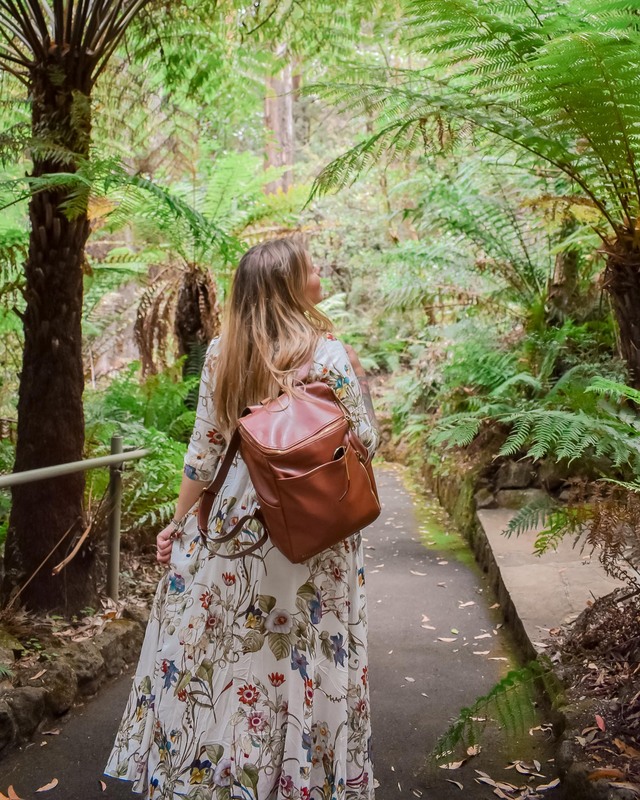 As a travel blogger and influencer – I always want to look my best when traveling (especially for the photos!). 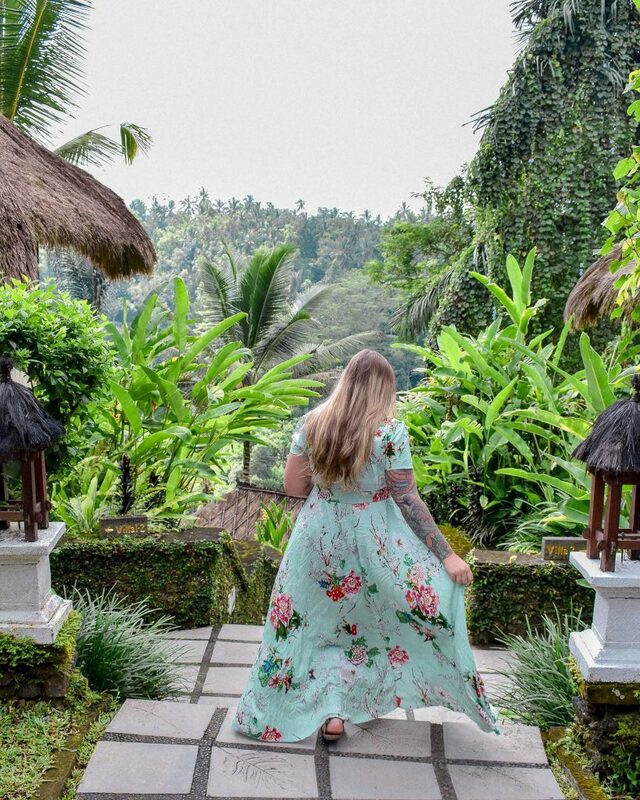 Staying on top of trends for the seasons is one way you can look your insta-best in your travel photos. 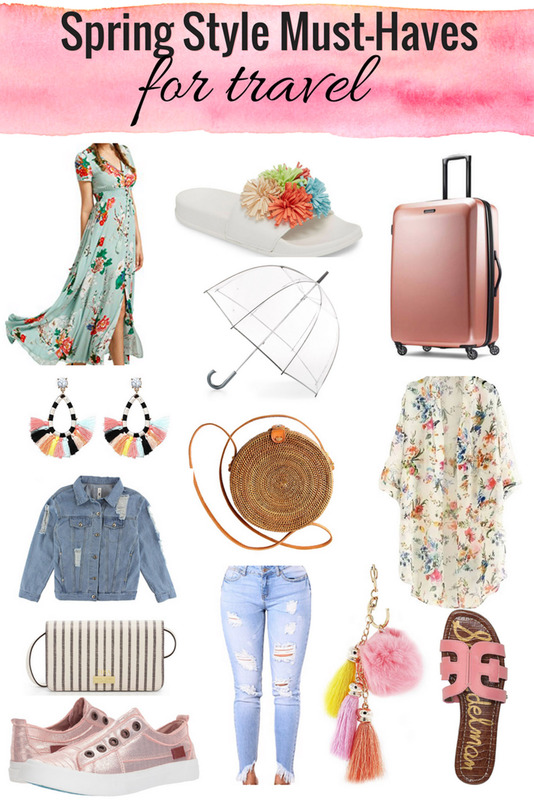 With my guide to Spring-Style for travel, you can show up and show off in your Spring travel photos! From a distressed denim jacket to distressed denim jeans – you’re going to love this trend for Spring 2018. I suggest opting for a light wash denim to pair with the pastels and florals you’ll want to be sporting this spring. 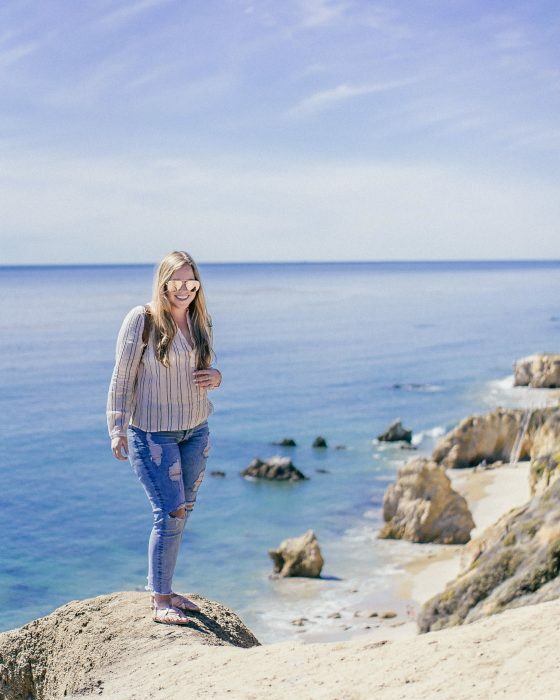 These distressed light-wash jeans are my personal favorite! They’re stretchy which makes them super comfortable for long-term travel and long-haul flights. Florals? For Spring? No way. I know, I know, this isn’t anything new. But! What isn’t broken – doesn’t need to be fixed and florals for spring is a classic. Not only will florals brighten up your photos – they can also brighten up a grey day which unfortunately can be expected during Spring. Spring brings a sense of a “fresh start”. What better way to show off a fresh start than with whimsical photos twirling in a flowy top, skirt or dress. What’s even greater about flowy dresses and skirts is that you can pair it with a trench coat to dress it up or a denim jacket to dress it down! My favorite flowy-floral dress ranges from $19-35 and comes in HEAPS of colors and patterns! Kimonos are a great item to have for those days when it’s beautiful out – but still kind of chilly. If it gets warm, you can take it off and it won’t be a burden to carry around. What’s even better? Kimonos will transition into summer perfectly, becoming a great cover-up for pool or beachside. If you’ve been living under a rock the last few months – allow me to introduce you to slides. These slides are super on trend for Spring and will transition into Summer, perfectly. 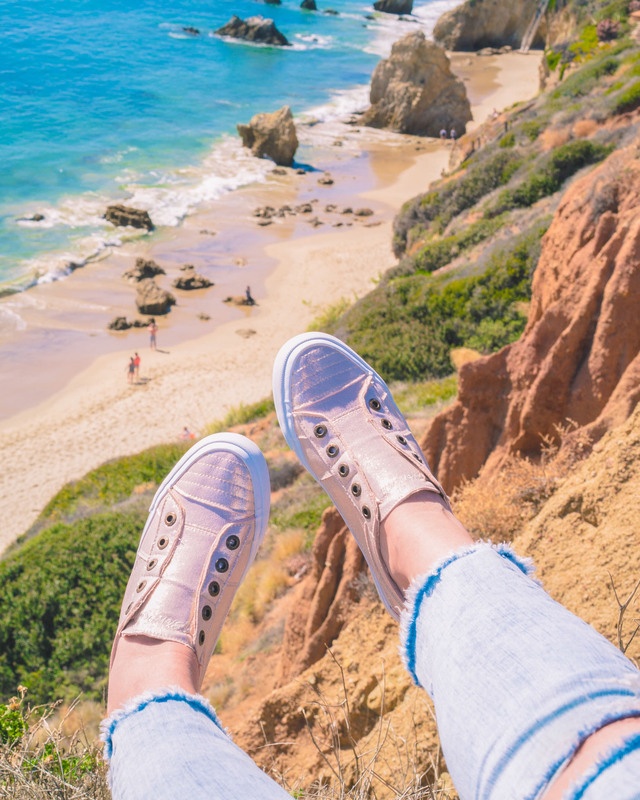 You can find sophisticated slides with leather or fun slides with patterns, tassels, or even fun phrases – there’s literally a slide for everyone. From earrings to bag accessories and on tops, cover-ups, bathing suits and more – tassels are IN. These tassels are a great way to add a fresh face to your Winter pieces. Hook a keychain tassel onto your favorite round Bali wicker bag or hook it onto a classic black tote to brighten up your wardrobe. 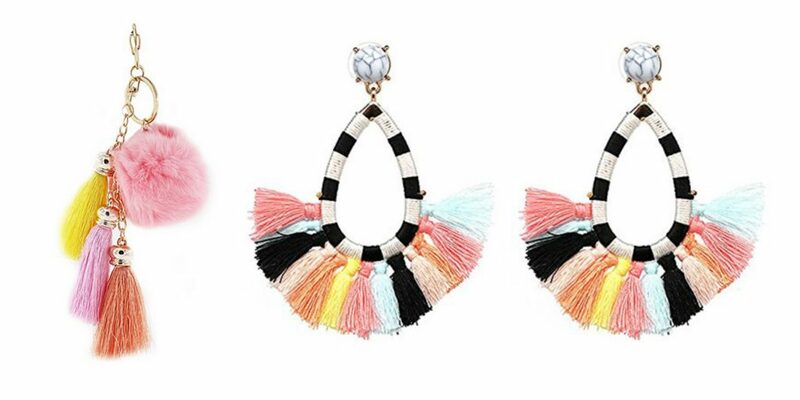 Colorful tassels are the perfect pop of Spring for your travel-wardrobe! The rose gold trend isn’t going anywhere. 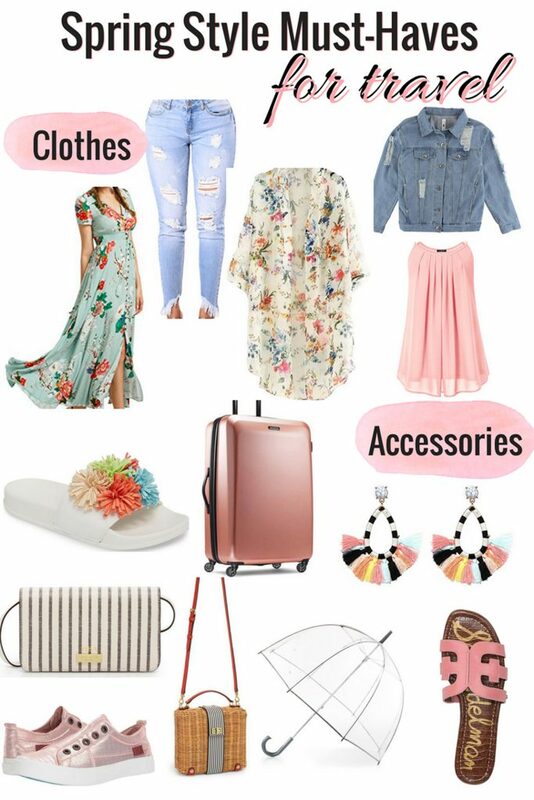 Rose gold accessories are a great way to spruce up your travel gear for Spring and the best part? Your rose gold sneakers or rose gold suitcase will be just as trendy in the upcoming seasons as it is in Spring! 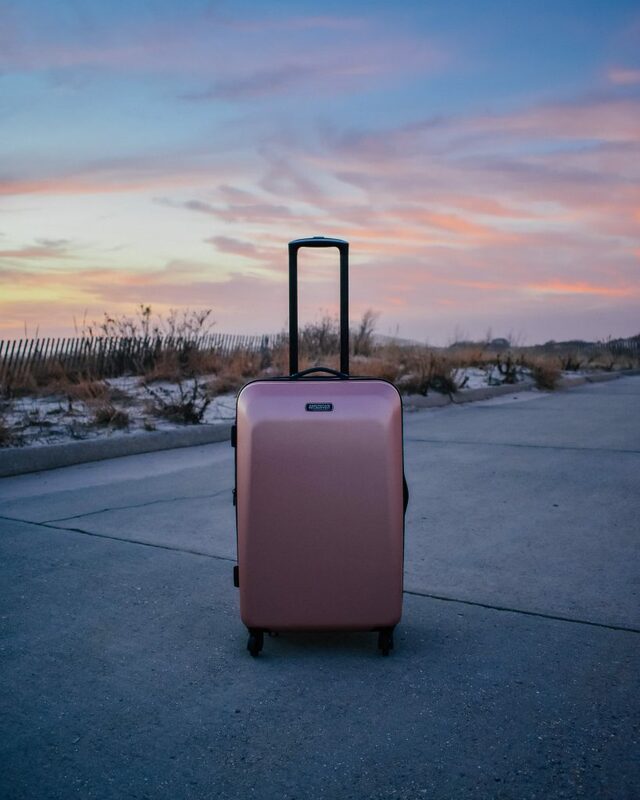 (left) My favorite rose gold luggage and (right) my favorite rose gold sneakers! Rain in Spring can be expected. The best way to not let April showers rain on your parade are to be prepared! A super cute clear umbrella or a fun pair of rain boots can not only keep you dry but also keep you stylish! Outside of florals – there are heaps of trends for this Spring season! Stripes, like found on this super convenient Smartphone cross-body case that doubles as a wallet, are not only on trend but will transition into Summer flawlessly. The wicker bag trend is also going nowhere anytime soon. You can opt for the original trend – the circle wicker bag or take it a step further and opt for a wicker bag with some stripes and color. From a circle wicker bag to a smartphone cross-body wallet, to a trendier wicker bag. – stripes and wicker are all on trend for Spring! Disclaimer: This post contains affiliate links which means that if you make a purchase I may receive a commission (at no extra cost to you). Wow I love everything you mentiones and want that wicker bag from Henri Bendle so bad now?? ?